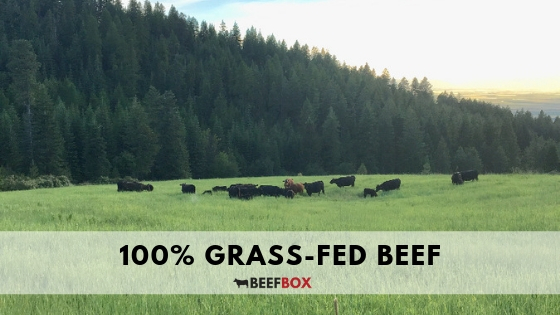 What’s the difference between grass-fed and grain finished beef? It’s actually very simple, 100% grass fed cows are fed grass and only grass their whole life. This can take the form of pasture grazing of course and winter hay. Grain-finished cows are just that, finished on a grain ration often in a feedlot setting. So how does the feeding effect how the meat turns out? This too is quite simple. Grass-fed beef is much leaner and has overall less fat than conventional grain-finished beef. Grass-Fed Beef is lower in Calories. Because grass fed beef is leaner and has less overall fat it is also lower in calories than conventional beef. Grass-Fed Beef is a Nutritional Powerhouse. It’s a great source of omega-3 fatty acids, vitamins, and of course protein. No Hormones or Unnecessary Antibiotics. Our grass-fed beef is free of hormones and we never use any unnecessary antibiotics. Vitamins. Grass-fed beef has been shown to contain the precursors to the important immune vitamins A and E4. Efficiency. Cows are one of the most efficient converts of sun energy on earth. By eating grass they naturally convert sun energy into nutrient-dense protein and fat.